Hi everybody! Vanessa here with an airy flower card. I love to combine blues, whites, pinks and purples in my garden beds and everything is about to burst open every minute. So I thought a bouquet of flowers using my favorite colors would look good on a card, too! I started with a panel of white cardstock that I had trimmed slightly smaller than my card base. For more texture, I embossed the panel with Cover Model: The Leaf Effect Cutaway and adhered it to the card. Now I die-cut the tag from Essentials: Noelle Cutaways from vellum and cardstock, layered them and adhered them with foam tape. 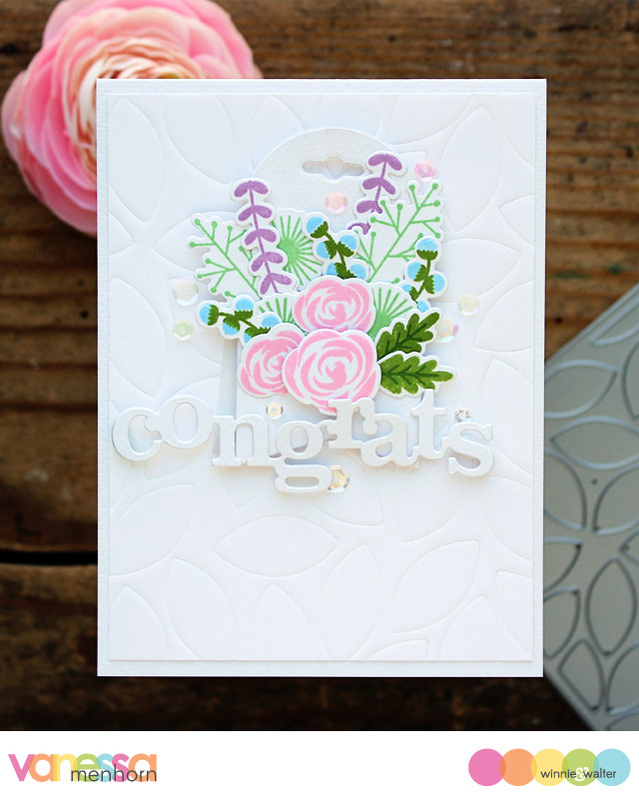 I stamped and die-cut the various flowers and leaves from In Bloom: Frenchy's Festive Florals with Angelica Suarez, In Bloom: Lola's Bouquet with Joni Andaya and In Bloom: Eva's Favorite Flowers and arranged them onto the tag. Now I die-cut In a Word: Congrats Cutaway from white cardstock and adhered it with foam tape. Finally, I added sequins. I hope you like my little flower arrangement! Thank you for stopping by today!! Oh what a stunner--love the embossed background (I have that cover model & will try it) & perfectly arranged bouquet! Love all the colors & can imagine how beautiful your garden is going to be as they bloom! wow! such a pretty and elegant card. 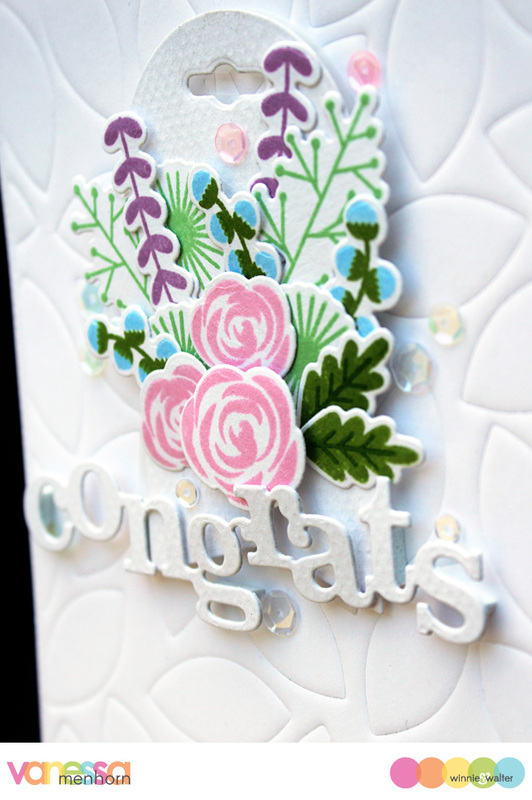 Love the white on white look and the flowers really look lovely against the embossed background.